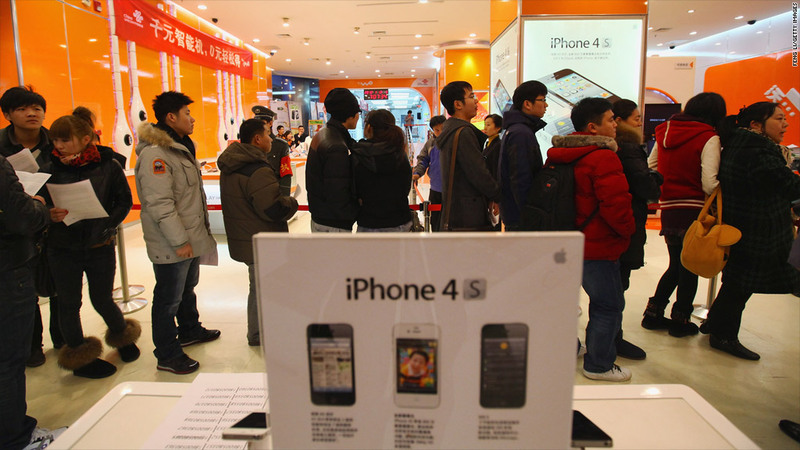 Chinese consumers line up to buy the iPhone 4S in a China Unicom store in Beijing. Apple may be ecstatic about the landmark $1 billion patent war it won against Samsung, but a recent report shows that Apple is a lightweight contender in a much more crucial battleground. 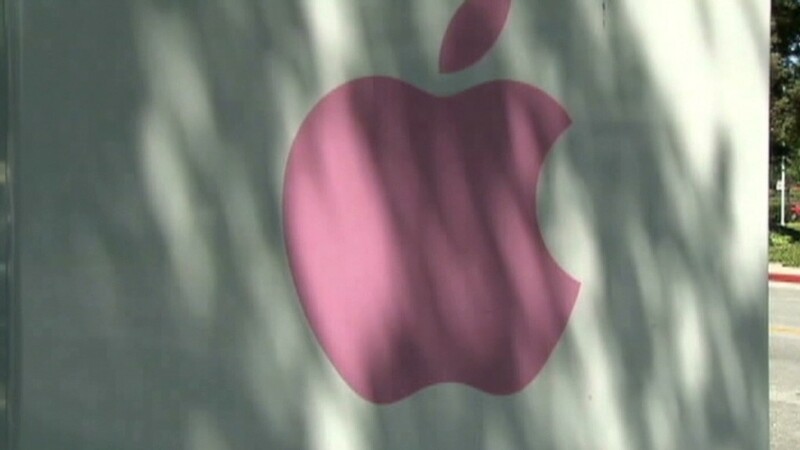 Apple's share of the Chinese smartphone market was just a measly 7.5% during the first half of 2012, according to IHS iSuppli. That put the company in seventh place, behind Samsung (No. 1), Nokia (NOK) (No. 5) and a host of native brands, including Lenovo, Coolpad, Huawei and ZTE. That's not a position Apple (AAPL) is accustomed to -- in nearly every other region of the world where it sells iPhones, Apple is in either first or second place. Seventh certainly not where the company wants to be in the critical Chinese market. China is set to become the largest smartphone market in the world later this year, after more than doubling the number of devices sold in 2011, IHS iSuppli says. If Apple wants to grab a larger slice of that rapidly growing pie, it may have to make some concessions to Chinese consumers. Price is a big issue -- the iPhone is a big-ticket item by Chinese standards. Phones aren't commonly subsidized by wireless carriers in China like they are in the United States, putting a top-tier device like the iPhone outside the price range of many Chinese consumers. For those customers who would have to save up months of paychecks to purchase an iPhone, many instead opt for an array of pre-owned devices and knock-offs, which are widely popular in China. But Apple CEO Tim Cook has said that the company has no plans to offer a less feature-rich device to compete with lower-cost smartphone manufacturers in the country. "I firmly believe that people in the emerging markets want great products like they do in developed markets," Cook told analysts on a conference call in July. "And so we're going to stick to our knitting and make the best products. And we think that if we do that, we've got a very, very good business ahead of us." Another strategy could be to develop an iPhone compatible with China Mobile's network, which has nearly 700 million subscribers. "Among all the international smartphone brands competing in China, Apple is the only one not offering a product that complies with [China Mobile's] air standard," said Kevin Wang, the IHS report's author, in a press release. "For Apple, this is a huge disadvantage." There have been rumblings and rumors of negotiations between China Mobile and Apple for years, but nothing has come of those talks yet. Still, it's not an insurmountable problem for Apple. No single smartphone maker has a dominant lead in China -- No. 1 Samsung controls only 21% of the market. Another research firm, IDC, is reporting somewhat rosier numbers for Apple. IDC puts Apple in fourth place -- not seventh -- with 10.1% of the Chinese smartphone market. That's still far behind Samsung (19%), but much closer to Lenovo (11%) and ZTE (10.4%). "When you get right down to it, China is a gigantic freaking market," said Ramon Llamas, analyst at IDC. "And to have double-digit market share is a testament to the strength of your brand and your devices. It's something that's not born overnight." In such a huge market, even 7.5% market share, he noted, is worth billions. "Apple is in a very golden position right now, in that it's a hot brand and a lot of people want it," said Llamas. "There are a ton of vendors who don't even have one percent market share. They would love to have 10.1% market share."